Amanda Bell will be in the Rose Garden of the Hospice on Saturday 13 May at 2pm and in one of the army tents in the Park on Sunday 14 May at 3pm. 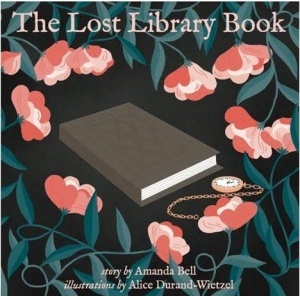 In this presentation, which is ideal for families and children, local author Amanda Bell will read from her new book, The Lost Library Book, which tells the story behind her husband’s discovery of a rare book in Harold’s Bazaar in 2012. She will also touch on the fascinating life of the Greek doctor Galen (who lived from 129 AD to about 216 AD) whose manuscripts were published in the almost 500 year old book. Galen had been a physician to gladiators and several Roman emperors including Marcus Aurelius. 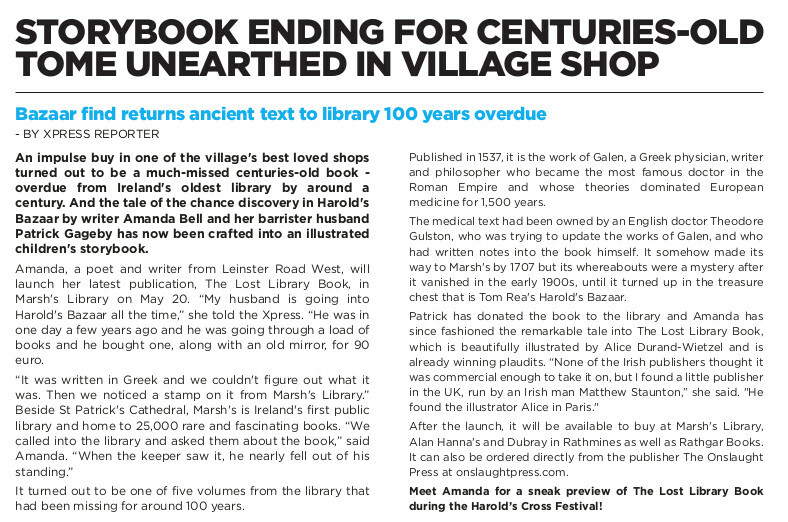 Marsh’s Library in Dublin acquired the book in the 1700s, but it disappeared almost 100 years ago until it was found in Harold’s Cross and safely returned to the Library! There will be plenty of time for questions after Amanda’s presentation. Amanda published “Undercurrents”, which is also of local interest, in June 2016. It features a lot of the underground rivers in the area, including the Poddle and the Swan. Undercurrents is shortlisted for the Touchstone Distinguished Books Award, bestowed annually by the Haiku Foundation on published collections of poems or works of scholarship representing noteworthy contributions to English-language haiku in the estimation of a distinguished panel of poets, editors and scholars. If you’re not paying attention, it is very easy to walk past the entrance to Marsh’s Library, a narrow metal gate in the high stone wall which surrounds the building. This place of quiet in the middle of the busy city of Dublin is crammed full of rare and ancient books. Marsh’s has remained unchanged since it first opened more than 300 years ago, and that is one of the reasons why people come from all over the world to read here. Some of our visitors have been famous, but most have been ordinary people who, like you, happen to love extraordinary books. The book you are holding in your hands tells the true story of a man who walked in to Marsh’s on a bright but cold day in 2012. Under his right arm (I remember it very clearly!) he carried something wrapped up in an old newspaper. “I found this in a junk shop. I think it might belong here,” he said. And it did. A very, very old book had come back home after a long absence from its proper place on the shelf.